One of the joys of living in central Europe is the ability to flit from place to place with cheap airlines. So, when a good friend announced she would be celebrating a significant birthday in Catalonia in October, we were there. I visited this corner of Spain a couple of years ago with the kids and was more than happy to repeat the experience with The One & Only last month. We booked a flight to Barcelona, a car and a boutique hotel in Begur, and packed our bags with bling, having been told this would be a dress-up party. 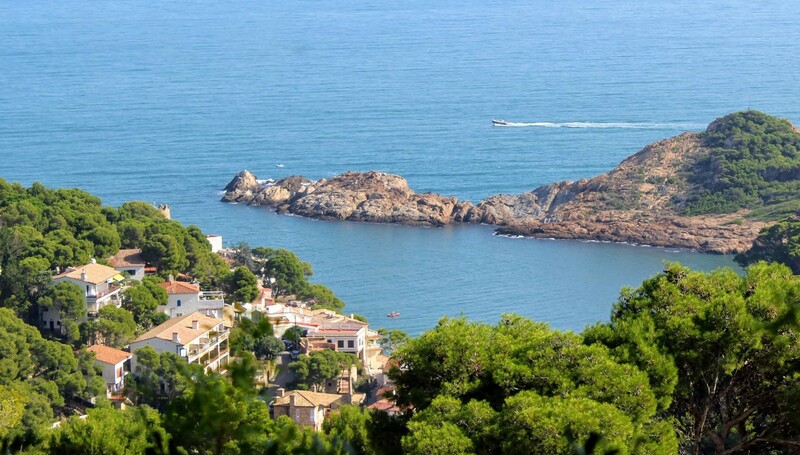 Begur is a delightful hilltop town ninety minutes’ drive north of Barcelona Airport on the Costa Brava. It has become a significant tourist destination, where the summer crowds can swell the town from an off-peak 4,000 to 40,000 at the height of the tourist season. And yet it maintains a sense of style, charm and calm not often seen in other tourist towns in the region. Luckily for those of us who are not in favour of crowds, the town has been returned to the locals by mid-October, parking is a cinch and there is always a table free at which to drink coffee, nibble on tapas and enjoy the blue skies and sunshine. Our hotel, Le Petit Convent, has been recently, and attractively, restored. Our room is bright and airy, with huge windows overlooking the neighbours glorious walled gardens. Downstairs, there is an attractive lobby and a cosy lounge area under arching stone ceilings. The hotel is only a skip and a jump from the town centre, where we find an impressive array of restaurants, tapas bars and cafes for such a small town. There are also several pretty boutiques and jewellery stores. Strolling through the cobbled streets and finding secret stairways to houses higher up the hill keeps us amused all weekend. Eventually, we clambered up onto the mediaeval castle walls, where we can gaze down on the terracotta tiled roofs of the old town and out to the heavily wooded and rugged coastline, with its beaches and fishing villages tucked into the nooks and crannies. Defense towers around the rim of the town have, in the past, doubled as look-outs and safe havens from the pirates who cruised the Mediterranean in the 16th century. While our friends have a modern house full of glass and sunshine on the lower reaches of town, the old town is a medieval jewel of twisting, cobbled alleys and shady squares. With touches of Moorish and mediaeval architecture, there is also an unexpected South American flavour here. In the nineteenth century, many local adventurers fled poverty and an economic crisis to make their fortunes in Cuba, returning later with enough money to build colonial style – ‘Indiano’ – villas, such as those along the main promenade, Carrer de Bonaventura Carreras. These grander streets are interspersed with cobbled lanes lined with whitewashed fishermen’s cottages. Everywhere we go, we come across wooden benches where we can simply sit and soak up the atmosphere. On our first evening, though, we are happy in our own company, and wander through the streets and squares, trying to decide where and what to eat. We eventually choose an outdoor café on the main plaza, where we share a bottle of red wine and a tasty selection of local tapas while we watch the world go by. Our waiter looks somewhat taken aback at our request for a whole bottle. Apparently local drinkers show rather more decorum than these thirsty Aussie tourists, and survive on a mere glass of Tempranillo. Neither will they need a steady arm to navigate the cobbles home again at the end of the night. The following day, there are several walking paths down to the sea and along the coast to be explored, but I selfishly settle myself in a café with a book, a notebook and a cup or three of coffee, while the One & Only scratches his calves to shreds hiking through the vicious wilderness. Later, I graciously agree to drive down through the pines and around looping, spaghetti roads to the coast, where we sip coffee on the seafront at Sa Tuna, overlooking a small family beach and a handful of fishing boats floating lazily on an unruffled bay. And the water, as promised by every website I have read, is absolutely crystal clear. This coastline is thick with such picturesque villages clustered around tiny coves. Further inland, there are also a number of attractive hilltop villages. Pals, only ten minutes’ drive north of Begur, and just a few kilometres from the sea, is one such spot. It is an absolute gem of turrets and honey-coloured walls, cobbled lanes ducking under stone archways and rock gardens filled predominantly with cacti. In summer, it is bedecked in a deluge of red and purple bougainvillea. We poke our noses into a smattering of craft shops and art galleries, and find a handful of good restaurants for lunch or a coffee break. And there are so many fabulous photo opportunities around every corner. This entry was posted in Food & Wine, Spain, Travel and tagged Begur, Catalonia, Le Petit Convent, Pals, Sa Tuna, Spain, tapas, Tempranillo. Bookmark the permalink.